When we made a decision last year to do an article aimed at finding great coffees at rock-bottom prices, we had no idea that the publication of this article would coincide with one of the most dismal times in recent American economic history. 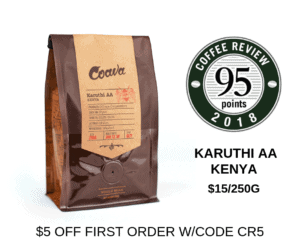 Our intention then was simply to find some bargain coffees to balance the more expensive selections that were beginning to dominate ratings at Coffee Review. True, our position has always been that fine coffee when brewed at home is a wildly underpriced beverage compared to wines of comparable quality. Nevertheless, we reasoned that there are many readers who cannot or will not pay twenty dollars or even fifteen dollars per pound for coffee, plus many companies that respond to this reluctance by producing consistently good coffees at relatively low prices. In conducting our quality-to-dollars search, we focused on coffees from distinguished single origins rather than on blends. Our logic was that bargain hunters should be able to indulge in some aficionado adventuring too, like their freer spending colleagues. How to source these top-value coffees? We ended up proceeding in two ways. First, we asked a wide range of roasting companies to nominate what they felt were their own top-value coffees, in other words, coffees selling for, say, not much more than ten dollars per pound whose quality or uniqueness clearly transcended their modest selling price. Second, we did a little shopping run through outlets of three large grocery chains searching for quality single-origin coffees at low prices: Trader Joe’s, Whole Foods and Safeway Stores. As it turned out, some boutique roasters simply decided to produce some bargains especially for this article. All promised to keep them available for the next couple of months. Coffee Klatch, for example, a regular contributor of top-rated coffees to Coffee Review, sent two quite distinguished single-origin selections at the relatively low price of 9.95 per pound, including the 91-rated, quietly classic El Salvador 100% Bourbon reviewed here. Miguel Meza, the innovative coffee leader of Paradise Roasters, actually invented a new value coffee brand, XF, with its own website stocked with a modest assortment of bargain coffees. Perhaps XF may end up provoking a new kind of Internet coffee outlet, a source for high-end closeouts and overstocks, the equivalent of a designer store in an outlet mall. Miguel sent a coffee from the Indonesian art and resort island of Bali, a rare and exotic coffee both in terms of origin and cup that impressed with a 90 rating and a basement price of $8.67 per pound. Other Internet coffee sellers turned up who appear to specialize in everyday bargains, like Specialty Java with its 90-rated Ethiopia Yirgacheffe, Industrial Joe with its 88-rated Guatemala, or Arizona’s Lost Dutchman Coffee Roasters and its delicately cocoa-toned 89-rated Brazil, all at around $10.00 per pound. Will It Be Colombia or Colombia? That gets us to Trader Joe’s, the discount natural and gourmet food chain. Trader Joe’s offers a relatively wide range of single-origin coffees, almost all Fair-Trade and organic certified, packaged in environmentally friendly valve-topped fiberboard cans. Two of those we cupped, unfortunately, suffered from a stubborn West-Coast coffee habit: roasting single-origin coffees so extremely dark that almost no character survives from the green coffee. Trader Joe’s describes the Ethiopia reviewed here (83) as a “medium-dark” roast, but by Specialty Coffee of America standards it is an extreme dark roast, almost off the charts, the sort of charred, bittersweet product we usually describe as a French roast. This extreme dark roast, considerably darker than Starbucks or Peet’s, turned this delicate coffee watery and lifeless, with only the barest hint of Ethiopian flowers (and not much else) surviving. Another Trader Joe’s selection reviewed here, a Sumatra (85), was roasted with more tact. The Trader Joe?s coffee offerings also raised issues in regard to the wisdom of offering Fair-Trade certified coffees at bargain prices. With the popularity of the Fair-Trade idea among consumers, a crowd of dealers and roasters now bids up the prices for a relatively small pool of high-quality Fair-Trade-certified green coffees. These high-end Fair-Trade green coffees are purchased from their small-holding producers for much higher prices than proposed by the relatively modest Fair-Trade minimum. I have to assume that the disappointing quality of the three Trader Joe’s coffees we cupped, all certified organic and Fair-Trade, was in part owing to the fact that these green coffees were what was left after the quality-oriented buyers were finished picking through the Fair-Trade market. A consumer who really cares about the success of small-holding growers and the integrity of the Fair-Trade concept might make a better contribution to the well-being of peasant growers by purchasing a better quality Fair-Trade coffee at a higher price, trusting that the rigorous Fair-Trade traceability assures that a good percentage of that higher price actually makes it back to the cooperative that produced the coffee. I regret that we did not stumble across a ten-dollar coffee that absolutely stunned us with its distinction, like those 93-through-97-rated coffees that regularly turn up when price is no object and lot sizes are tiny. But we certainly found some excellent and very distinctive coffees, ranging from the svelte El Salvador from Coffee Klatch through the juicy Rwanda from PT’s (91), the idiosyncratic Bali from XF, and the fragrant Ethiopia from Specialty Java to the quietly cocoa-toned Brazil from Lost Dutchman. The $7.99 per pound Eight O’Clock Colombia sample was perhaps the most impressive in terms of dollars to distinction, though I have some trepidation assigning high ratings to coffees produced with the kind of volume to which Eight O’Clock is committed. Hopefully Tata Coffee, the relatively new owners of this storied brand, will impose the rigor necessary to maintain the classic poise of the Eight O’Clock Colombia samples we cupped for this review. 2008 The Coffee Review. All rights reserved.